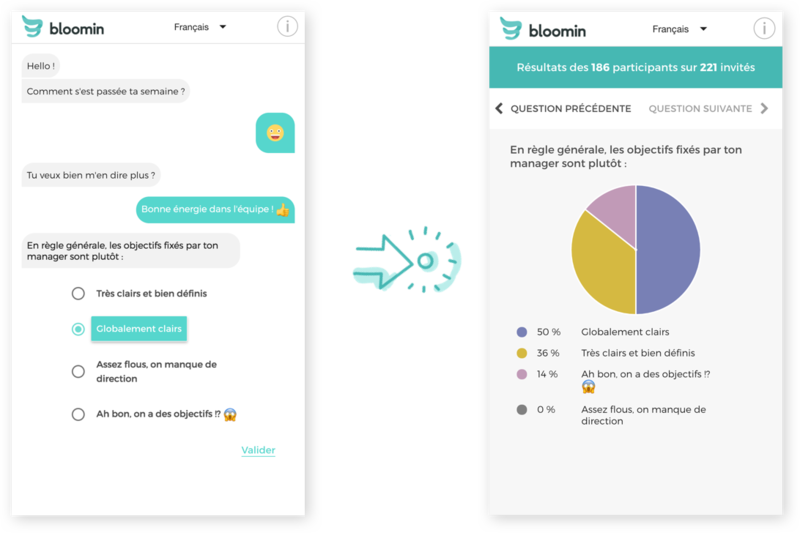 Product - Bloomin : mesurer régulièrement, agir rapidement. 1. 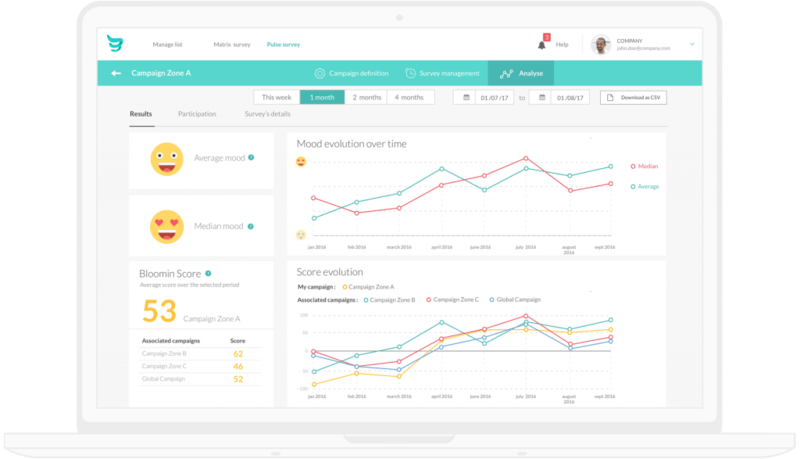 Create an engaging survey, easily. It’s quick with the Bloomin library which contains 200 questions classified by themes. It’s customisable with questions made to answer your needs. 2. Employees reply regularly a the blink of an eye! Thanks to our unique Chatbot, answering surveys becomes quick and engaging for your employees, allowing the best participation rates. Our survis are conversationnal. It’s fun for your employee to answer, they can use emojis and GIFs. 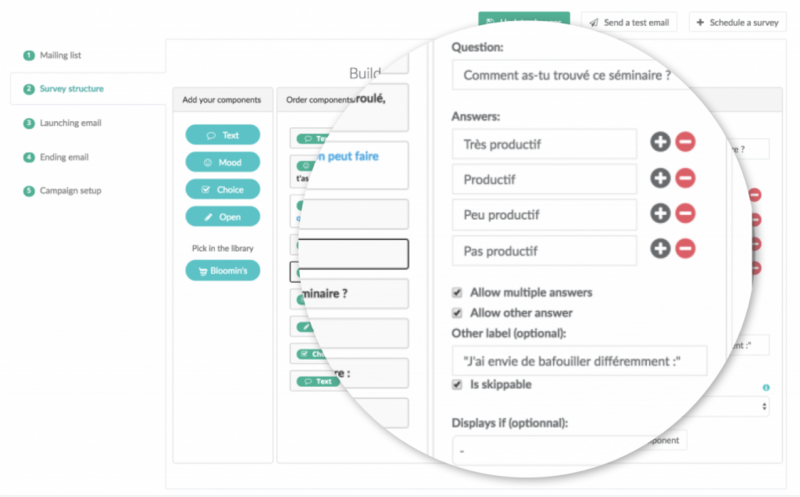 It’s also flexible to fit yours needs: you can choose your own questions and their type (opened or closed, pulse, multiple choice…). Our experience is based on reciprocal attention: once the survey is completed, all the participants’ answers are shared anonymously. Comparing the promoters and detractors. Track human indicators as you do with the financial ones, easily. Implement collaborative working conditions within your team and measure its performance in a transparent and benevolent manner. Bloomin can be used on all devices so that each employee may answer however he/she prefers. Bloomin can easily be integrated: emails, job apps, smartphone apps or company networks. If some of your employees don’t have email addresses, Bloomin can give them a link through the media of their choice. Opened, closed, multiple choice questions, with pictures, skippable or not, everything is possible! The answer results are available in real-time to those you grant access rights to. Users can add GIFs and emojis in their answers. Bloomin NPS, participation rate, ambassadors and detractors complement/supplement the measure of employee experience. Once a survey has been launched, the reminders are sent automatically to the employees who haven’t answered it yet. You can export the results at any time and sort them with the criteria of your choice. More than 200 questions about employee experience are available and customisable to meet the needs of each company. From the statute of the applicant to the onboarding process and the management of talents, more than 10 professional careers are available and customisable on the website. Schedule your surveys, they will be sent automatically.